This Soothing Therapeutic Herbal Tea is just what you need for these winter months and can help soothe the symptoms of whatever ails you. From the sniffles, to stomach upset, this tea will help warm, comfort and relax as you head down the path to health and wellness. There’s no getting around the colds and flu that are floating around this time of the year. 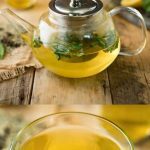 If, like me, when you’re feeling under the weather all you want is a soothing cup of tea and this tea has so many components to help relieve your symptoms. I do not like any cold medicines. The daytime ones wire me out and the nighttime ones make me groggy the next day. Each ingredient really does play a part in treating all that ails you. I’ve created this tea with natural healing ingredients, this will be your comforting elixir if you have a cold or recovering from stomach flu and just starting to eat. Chamomile tea – A relaxing tea to help promote sleep and the heat will help relieve decongestion. Chamomile can also help reduce a cough frequency and is also an anti-inflammatory that can soothe an upset stomach. Lemon juice – The vitamin C immune boost can help fend off a cold or speed up the recovery from a cold as well as cut through congestion. Turmeric Powder – A natural anti-inflammatory, high in antioxidants and a good immune booster. Honey – Commonly known to sooth a sore throat as well as a natural cough suppressant. Mint – The minty extract in the steam of a hot drink can help a stuffy nose and open up the airways as well as an expectorant to help soothe a cough. To a teapot add the fresh mint sprigs. Add the infuser to the teapot and add the camomile tea bags, ginger, turmeric powder, lemon juice. Allow to steep for 5 minutes. Add a drizzle of honey (to taste) to each of the cups and pour over the tea. Stir to mix in the honey. Garnish with mint leaves.